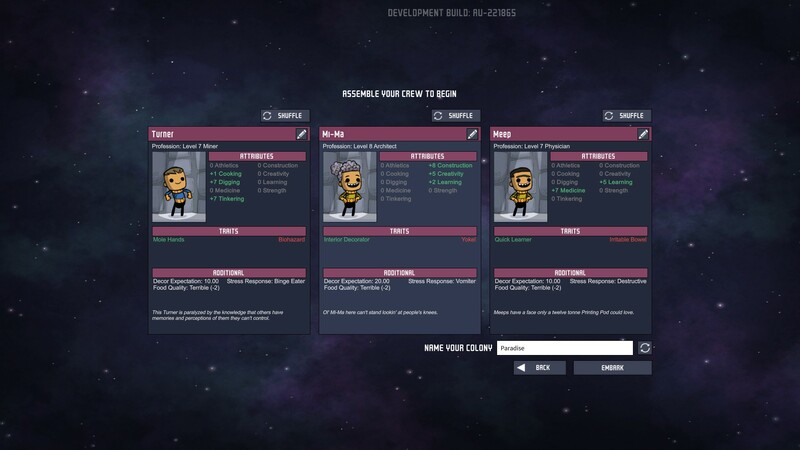 Oxygen Not Included was not optimistic about my first attempt to build a space colony. While cycling through the random name generator for my settlement, one of the names it suggested was 'Space Trainwreck'. I, a veteran of management sims from Dungeon Keeper to Dwarf Fortress, was not impressed by the implication. 'I’ll show you!' I said to my computer monitor in a way that didn’t make me look at all like a madman. I accepted the game’s mocking moniker and resolved to make Space Trainwreck the best darned Space Trainwreck there has ever been (which isn’t hard when you consider the number of times trains and space have encountered one another). And darn it if I didn’t do a bang-up job. Space Trainwreck may not have been the prettiest space colony ever devised. One might have observed that the outhouse should not have been built over hydroponics, and perhaps there were a few too many electrical wires running through the water supply. But everybody had a bed, there was plenty of food, and most importantly, there was sufficient air to breathe. Then I tried to build a shower, and it all went wrong. 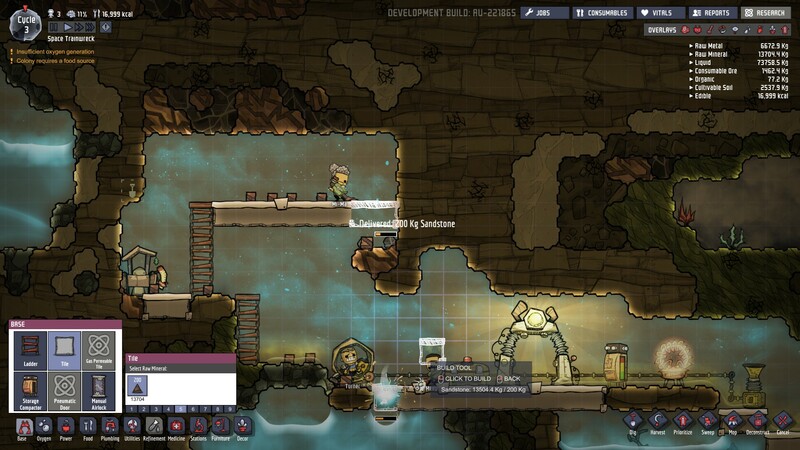 Before we delve into the douche-related demise of Space Trainwreck, let’s go over where Oxygen Not Included hails (or should that be ‘inhales?’) from, and what the developers are attempting to do to make it stand out from the colonial crowd. Oxygen Not Included is developer by Klei, the Canadian studio famed for its skills at artistry and remarkable ability to hop from genre to genre. From the kooky survival sim Don’t Starve to its marvellous tactical stealth game Invisible Inc, Klei possesses an almost uncanny mastery of both visual and mechanical design. Oxygen Not Included is no different, although its appeal is less immediately obvious than its predecessors'. It’s a colony sim in the vein of games like Dwarf Fortress and Rimworld, but it plays from a side-on view and at a smaller scale compared to the heavyweights of the genre. Indeed, you begin a game with just three colonists, or 'Duplicants', who must lay the foundations of your colony, with more duplicants arriving at frequent intervals as your colony grows. The setting is the randomly generated interior of an asteroid, filled with all manner of minerals and materials which you can dig out to help construct your colony and sustain your duplicants. These range from sandstone that can be used to construct basic floor tiles, to 'algae' which can be turned into a basic foodstuff for your duplicants. Everything you’d expect from a colony sim is present and correct in Oxygen Not Included. You don’t control duplicants directly. Instead you assign them certain jobs such as 'Digging' or 'Research', and they figure out a plan of action for themselves. 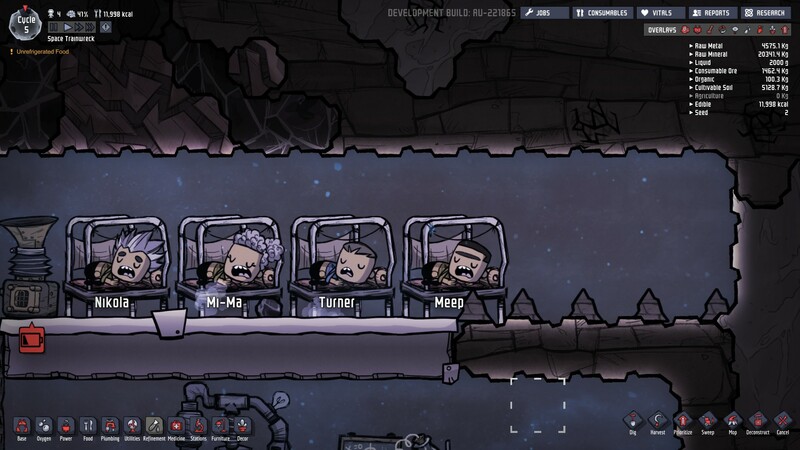 Duplicants also have basic needs that must be met, such as eating, sleeping, and stress relief, the latter of which is particularly important, as stressed out colonists can go off the handle, binge-eating or just running around breaking stuff like whopping great space toddlers. In addition, Duplicants possess more specific personality traits that can positively or negatively affect the colony. One of my colonists, a silver-haired fellow called Abe, excelled at virtually every job in the colony. But he was also a narcoleptic and would randomly fall asleep in the middle of a research project or repairing a machine. All of this is both well balanced and brilliantly presented, with Klei’s trademark art and animations lending the game a lively and lightly comical tone. But it’s nothing we haven’t seen before. Moreover, the game doesn’t possess the level of depth of either DF or Rimworld and so can’t produce the same quality of bonkers emergent stories which both games have become so well known for. 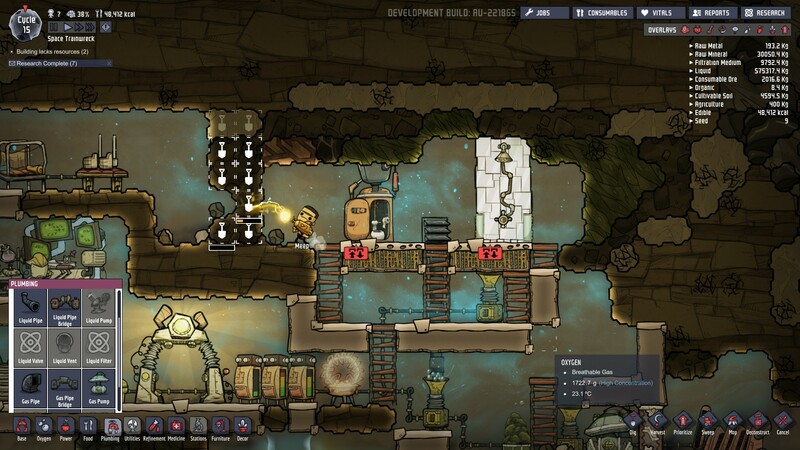 Where Oxygen Not Included attempts to stand out is in its gas simulation. Not only must you ensure that your Duplicants have enough food and protect them as best you can from physical and mental hazards, you also need to ensure that the air in the colony is breathable. You’ll start off in a small oxygenated pocket of the asteroid. But your duplicants will soon respire that into carbon dioxide. Hence, you need to either locate other pockets of oxygen inside the asteroid or produce your own through various means. At a basic level, this can be achieved by converting algae into oxygen through the originally named 'Algae oxygenators'. However, Algae is also your starting foodstuff, which means it gets consumed quicker than jelly and ice-cream at a child’s birthday party. To survive long term, you must build pipelines to pump gas from one location to another and find ways of filtering oxygen from water and other gases. 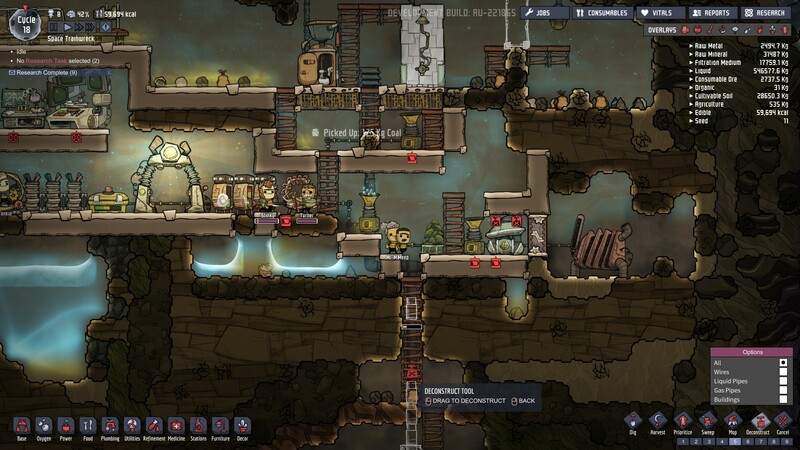 Consequently, Oxygen Not Included soon shifts from being a basic colony sim into a far more complex game of constructing elaborate pipelines and automated systems. Physics plays an important role, too. Heavy gases sink to the bottom of a room, while lighter gases rise to the top. 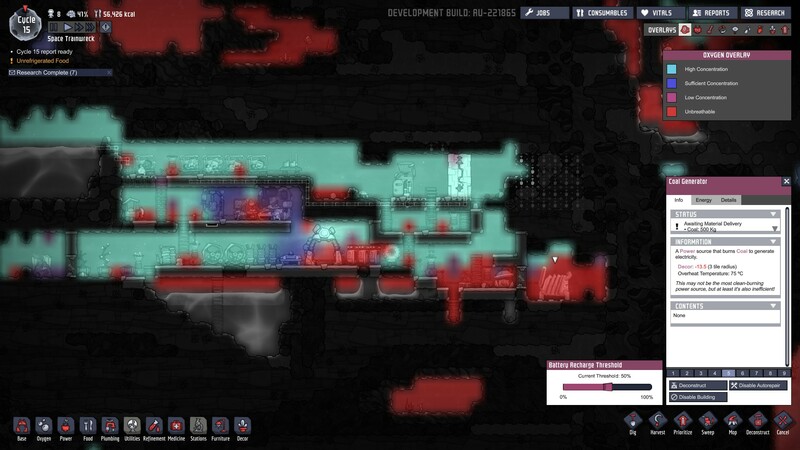 Mining into a pocket of CO2 from the bottom up is a bad idea, as it’ll flood your colony with toxic gas. What’s more, as you expand the colony, you’ll need to deal with other gases such as hydrogen and chlorine. Water is also a problem, as you’ll need to harvest it for growing plants and keeping your duplicants clean, but accidentally digging into an aquifer can flood your colony, leading to hypothermia and, if the water is or becomes polluted, the spread of disease. This is also how the plucky duplicants of Space Trainwreck met their untimely end. I spent ages constructing an elaborate plumbing system that would pump water from a nearby aquifer, carry it to my newly installed shower and toilet, and then dispense the polluted water into a walled-off cavern I’d dug out specifically for the purpose. But one of my duplicants unwittingly dug out the bottom of the aquifer while laying the pipes, causing a massive flood throughout the colony. This led to a long and arduous mopping-up operation, during which time I ran out of algae to fuel my oxygenators. My colony began filling with carbon dioxide quicker than a soda-stream factory that’s been struck by a tsunami. With the situation rapidly shifting from inconvenience to emergency, I quickly dug a shaft that led down to an air pocket surrounded by algae blocks. Sadly, I failed to notice that the pocket was a vacuum, and when two of my Duplicants broke through and dropped into the cavern, they suffocated. Now without enough manpower to refill all my oxygenators, the rest of the colony would have suffered a similar fate, had I not switched the game off in defeat beforehand. My ill-fated plumbing project demonstrates how easily and unexpectedly a situation can spiral out of control. As more duplicants arrive and you consume resources faster, you need to expand your colony more quickly, which also makes it more dangerous. It becomes harder and harder to juggle all the spinning plates, to oversee larger construction projects that ensure the colony’s long-term survival, while ensuring that the basics are being tended to. I like Oxygen Not Included; there’s plenty of satisfaction to be had in constructing your colony, and the gas mechanic adds a challenging and ever-shifting puzzle element to the layout of your colony and building new rooms. It’s also fairly easy to get to grips with, which further helps it stand out in a genre dominated by complex and forbidding designs. That said, I don’t love it yet, and I’m not finding it as captivating as I have Klei’s previous efforts. I think the problem, somewhat fittingly, is that Oxygen Not Included is a little short on atmosphere. Thematically, it isn’t as strong as either Don’t Starve or Invisible Inc, lacking the weirdness of the first and the character of the second. Moreover, as I already mentioned, it doesn’t contain the systemic depth of the likes of RimWorld. None of this makes it a bad game by any means, just one that’s a bit short on identity, and the gas mechanic, while interesting, isn’t quite enough to make up for that. Fortunately, another thing Klei excel at is Early Access projects, having served both Don’t Starve and Invisible Inc brilliantly during their pre-release states. 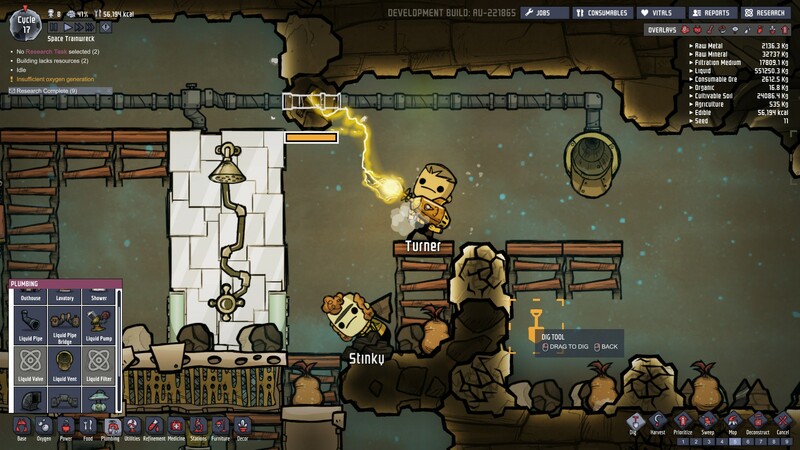 If Oxygen Not Included receives a similar service, it could still end up being quite special.